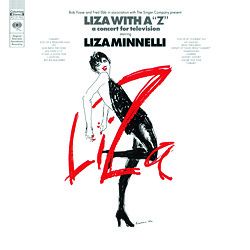 Liza Minnelli: Liza With A "Z"
﻿"Liza With A 'Z'" is a multi-media production that has been showered with superlatives. It won numerous awards, including those for Choreography and Direction. However, a further award for the music composed by John Kander and Fred Ebb is probably the main reason for the show being released on a record, i.e. just for the ears. But the plan bore fruit, and the LP rocketed onto the Billboard 200. It was to be Liza Minnelli’s best chart hit ever – and it could even be called the soundtrack of her life. Great favourites such as "Ring Them Bells" and "Bye Bye Blackbird" are set alongside sharp rhythm and blues numbers ("Son Of A Preacher Man", "I Gotcha"). Taking centre stage is a 10-minute medley from the film adaptation of the musical "Cabaret" that was shown in the cinemas also in 1972 and which brought Minnelli her international breakthrough. All that remains of this costly and glamorous television event, which was only broadcast a few times on US television after the premiere, is the original music on record. Here it is once again in all its glory and with a new freshness.